You know, I liked this book. I say that with a hint of hesitation, because it's not a perfect book. And there are things that I disliked. That's go to a list. -As a Pride and Prejudice obsessee, I loved seeing the Bennet family from a different angle - through the servants. 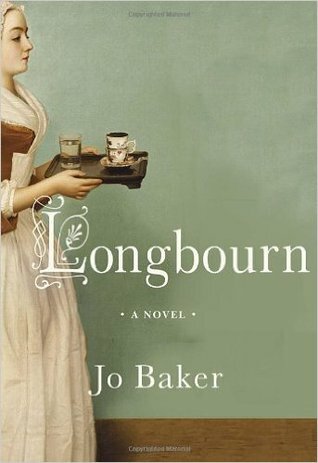 I loved how the book followed along with the Pride & Prejudice story, in addition to the book's plot. -I loved getting a feel for what running a household would be like in that era. The level of drudgery and work for little gain. I also liked seeing how the servants had their own lives right under the Bennets' noses. -I liked the basic elements of the plot. Sarah comes into her own while slowly falling in love with James the footman. It wasn't the most original of plots, but there's a reason that coming-of-age love stories always work well. -I felt like the book went overboard trying to showcase how hard life was. Emphasizing walking around manure and the ickiness of servant life. Not because it wasn't true, but more as an attempt to be as extreme as the perfectness of Jane Austen books. If Pride & Prejudice is going to be sparkling clean, let's make this as dirty as possible (in the literal sense, not the prurient sense). It was to prove a point, not to serve the story. -Some of the choices Ms. Baker makes in this story will be heresy to Pride and Prejudice fans. The big glaring *wow* didn't really bother me, but it's something that will upset many Austenites. I did dislike how Mr. Darcy was portrayed in the story. Not because it was wrong - per se - but it didn't quite ring right with me. -I wasn't fond of the ending. I can't decide if that's because it was too abrupt or because it wasn't the way I wanted it to end. A little of both, probably. I felt like it sort of petered out. Almost a fade to black. That's not exactly accurate, but it felt like she couldn't think up an ending or at least a way to write it to make it feel complete. Plus, I would have chosen a different path for the characters, but that's just me. Overall, not a perfect book, but still one that I enjoyed and would recommend. Recommendation: Borrow for all Jane Austen fans. I really struggled with this one to be honest. I was expecting for a fun, amusing book like P&P and the darker tone and writing is a striking contrast. It also didn't help that I picked this one when it got so much hype and publicity for it. I've been circling this book since it came out. I've never (fully) read Pride and Prejudice so I wonder if the bleakness the world will be less evident. I might grab this from the library if I see it.